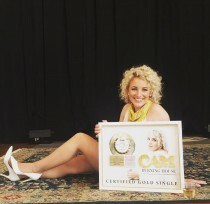 The stunning single ‘Burning House’ by new country star Cam, currently sitting at #4 on the Billboard country singles chart, has been certified gold, marking the sale of 500,000 copies! The track, co-written by Cam, is based on a very personal experience for the Californian artist – a dream she had about her regrets in a previous relationship. The success of ‘Burning House’ continues to grow, and the track has now been streamed over 13 million times on Spotify.